“I have been asked typical questions like ‘how long did you take to finish this piece of painting?’ And as always, I would reply ‘25 years and a few hours’,” said Ng Woon Lam. In June 2008, a chanced visit to a fine art gallery in Tanglin shopping center, Singapore – gave me a glimpse of an artist’s 25-year journey to becoming who he is presently; a full-time artist, a fine art advisor and also a gallery owner who has sold hundreds of artworks mainly in the United States, South Africa and all over the world. Li Fine Art is Ng Woon Lam’s gallery which have been representing established 2nd and 3rd generation Singaporean artists namely, Ang Ah Tee, Ong Kim Seng, Tong Chin Sye, Teng Nee Cheong, Ng Woon Lam (himself), Koeh Sia Yong, Tia Kee Woon, Wee Shoo Leong, Khor Ean Ghee, Lok Kerk Hwang and many other renowned local artists. “Do you buy paintings ?” was the first question I asked Woon, upon stepping into his gallery while he was painting. With an expression that reckoned if this question came from a fine art novice, he answered, “Yes we do, but we determine the value of paintings based on the national and international recognition of the artist; practically we showcase artworks and paintings and don’t purchase them.” This ‘unusual’ answer had somewhat brought awe and disappointment to my expression, or whatever most emerging artists could name it, as I was reminded of how my artist friends have their works rejected by galleries that are not willing to purchase them, irregardless of how good they claim their works to be. “I’ve to admit that it’s often not easy for their works to be accepted by most galleries, and if new artists are really serious to become successful as full-time artists, they have to possess perseverance, strong passion and knowledge that develop great skills in producing quality artworks, which possess the merits to be showcased in their solo exhibitions worldwide. In fact, I took more than 20 years of honing my painting skills before my dream as a full-time artist could be fulfilled. “My journey to becoming an established artist is a process which took years and prior to that I didn’t have a formal qualification in fine arts. Four years ago, I was in my 10-year engineering career that could support my family. My journey to becoming a full-time artist is a process that have involved passion, focus, perseverance and discipline; every evening after work, I would return home to paint. For 20 years, I have refrained myself from watching movies and even TV shows because I believe in dedicating my spare time in realizing my dream which I has since I was 12. While I paint as much as I can in my spare time, I seek to acquire more knowledge of improving my painting skills through reading various art books and painting everyday. Among the many art books I have read, there are several art history books that could comprise over 1000 pages. As you can see, honing my painting skills is like a continuous journey which requires passion, hard work and patience,” said Woon, originally a Malaysian who relocated to Singapore at an age of 21. Woon’s dream was beginning to be realized in 2006 (through 2007) when he participated in several exhibitions, winning several national and international awards (see Exhibitions and Awards). His paintings were also accepted to be showcased in The American Watercolor Society’s International Juried Show and The Oil Painters of America. “I learnt a lot from local artists especially artists in Singapore Watercolour Society. My most important mentor here was Mr Gog Sing Hooi, late president and founder member of Singapore Watercolour Society,” Woon adds. In 2004, Woon received partially sponsored bursary from the National Art Council to study fine arts at The School of the Art Institute of Chicago then New York Academy of Art from 2005 to 2007. Over there, he observed how the institution and the country have placed strong emphasis on the education of young children in nurturing them to become artists. Art education and facilities have been offered free to young children – part of the country’s strong focus on developing the creativity of children in their young age. Since then, Woon lived with his wife in the US for about 3 years and during that time, they have sold many paintings – and Woon even joked, “the UPS guy almost became part of our family.” His paintings and articles have been featured in art publications (as listed below). His most recent article, ‘seeing with fresh eyes’ was published in International Artist (April 2007 issue). In 2006 with a vision to promote the works of Singaporean and Malaysian artists, as well as nurturing local talents to gain success in their art journey, Woon returned with his wife to Singapore to run their gallery (at Tanglin) and teaches private painting classes. Subsequently I found myself enlightened by an insightful conversation with Woon, especially his positive outlook of the Art market where artists (of any race, levels, age and nationality) can be offered equal opportunities to receive sponsorships and worldwide recognition for their works, as long as they demonstrate great skills, discipline, passion and determination in producing quality artworks. At the same time, he has also maintained his realistic views on the opportunities for success in the art scene, by not giving artists-to-be the delusions they can obsess themselves into. To Woon, creativity is truly about having the right skills, good judgement, strong knowledge and capability in producing artworks with the aesthetics that invoke high level of appreciation, high quality print, and speed as well. He believes a good painting has to be worth the value the collector is paying for – the correct painting process and high quality art materials must have the remarkable quality that can self-preserve itself to last a life-time, besides being just a painting that has satisfied the senses. 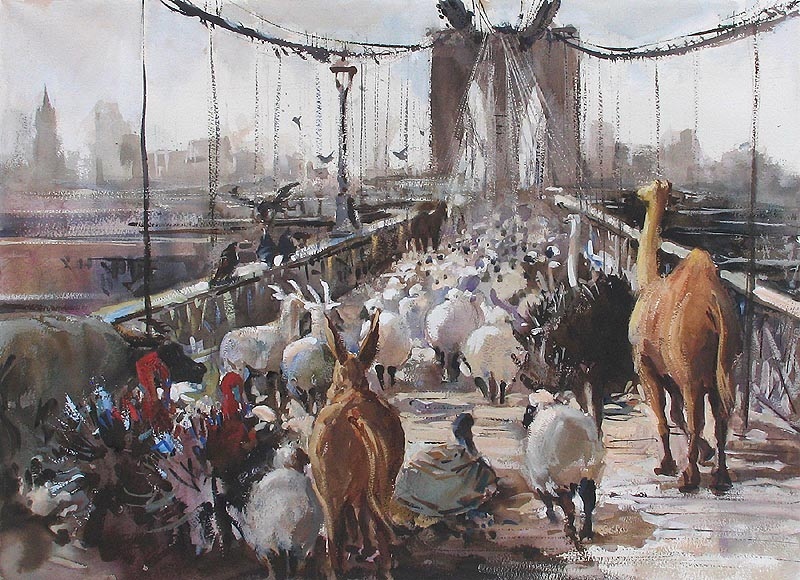 One of his notable works that was awarded 1st Prize by Singapore Art Society in the 2007 National Exhibition, is ‘Animals Crossing Brooklyn Bridge’. It was a story of an MTA (New York City Transit) strike in the winter. It was about 0 degree C. Mayor Bloomberg walking across Brooklyn Bridge together with many New Yorkers to get into Manhattan to work. That was featured in the news. The animals here represent the diversity and richness of New York culture. That kind of well reflects the great success of New York art scene. In Woon’s other painting ‘Singapore River and Reflection’, he designed the direction, size of the boat together with the placement and different intensity of the reflections. The complex interaction of each subject matter here allows a viewer’s visual sequence to happen according a properly planned speed and direction. Therefore, whichever angle or corner, a viewer enters the image, will still lead his/her vision sequentially across the whole composition. “This is the power of visual language,” said Woon who believes that a painting process involved a lot of understanding of visual process and sequential behaviours of a viewer. Woon’s words ‘25 years and a few hours’ is not for the faint-hearted but a statement of inspiration, which means “25 years of effort and perseverance in learning to achieve the speed of producing one great piece of painting in less than 2 hours,” – and an encouragement for those who are determined to leave their careers someday to afford a transition to becoming full-time artists. 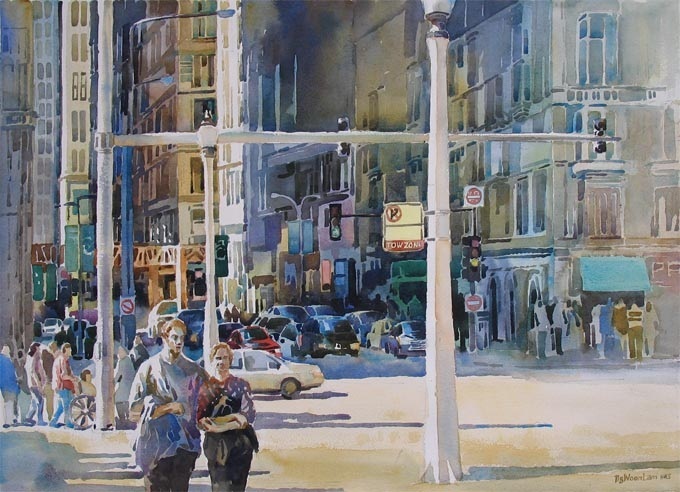 • American Watercolor Society , 139th Annual International Exhibition Jury of Selection : Janet Walsh, Judi Betts, Nessa Grainger, Mel Stabin, Betsy Dillard Stroud, Alan Wylie (invited juror) and Travel Shows.